I would normally just move stuff out of the way and try and coexist, but do you know how much that paper bin weighs !? 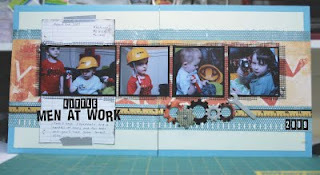 Putting it up out of the way every time Parker decides he needs to scrapbook isn't exactly easy! 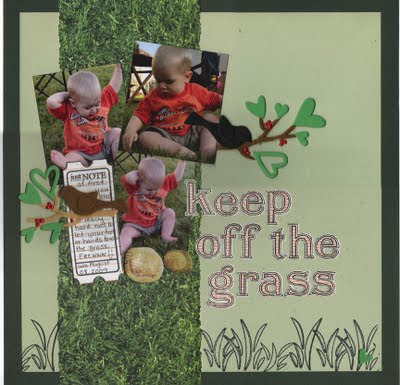 I never thought I'd do such a random page with such an odd title...but that's what you get when you take a challenge like the one from Scrap the Boys challenge blog this month. I had to use a photo of my boy(s) with food, and try and use a cooking term in the title. "pickle" is definitely a noun, but it's also a verb, and a cooking term as much as "saute" or "whip" right?! ( not hard is it!) Go check out the amazing pages done by the design team, and the great sketch provided once again by Juliana Michaels. 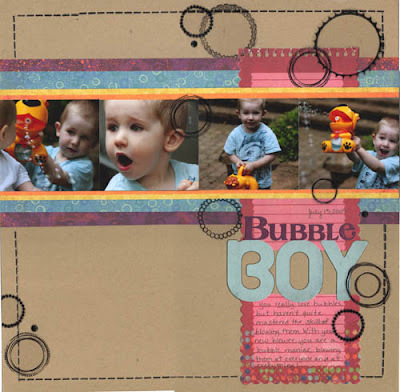 This week the challenge is to use only scraps to create your layout ( aside from the base cardstock or pp.) Out came Ethan's container full of squares and circles! In my opinion, it still needs Thickers or something, I'm just not used to such a flat page. It did take me in a different direction than usual though. Oh yeah- this dirty little boy is now walking 4 or 5 feet at a time and is able to squat to pick up toys, return to standing and even remain upright while in a tug of war with his big brother. Next week he'll be keeping me running I'm sure! Last week end we went to a BBQ at a friend's place. I finally caved and let Parker play in the grass. Don't get me wrong, I don't mind either of the kids getting dirty, in fact I have been known to encourage it at times. I'm just afraid of all the weird stuff that Parker might eat. This is only the second time this summer that i've set him down in the grass, and it was hilarious both times. He didn't want any part of his skin to touch it, and kept lifting his feet and hands one after another. He got over it almost as quickly as I got over the guilt I felt for laughing at him. 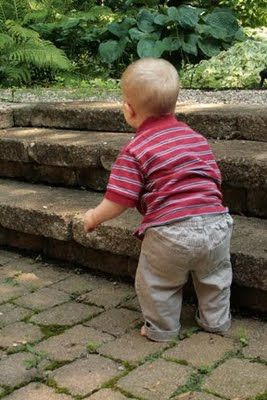 Did I forget to mention that this little darling decided to take his first steps on Wednesday afternoon? Yep- right in the middle of our family room ( this photo is not our family room- this was yesterday on our back patio as I tried to photograph some layouts quickly :)). He teetered for a second, took a step then sat down. He got right up and did it again 2 more times in a row. Unfortunately we ran around so much yesterday he didn't have much chance to try it again. 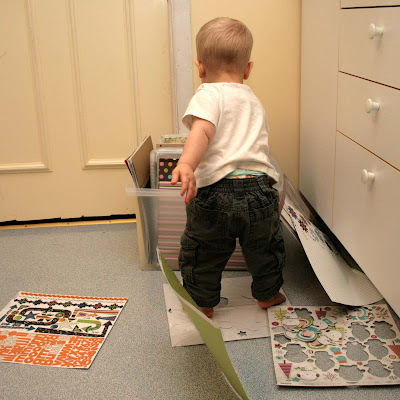 I figured he'd literally follow in his brother's footsteps and start walking around the 12 month range. Had to figure he'd be trying to "beat" Ethan and start at 10 1/2 months! I'll have the point and shoot ready to catch some video today if he decides to do it again! Thank goodness for good friends to get you out of a rut! Not only is my friend Claude good at getting me started with a good challenge, she's also encouraging me to use up some of my plentiful stash. 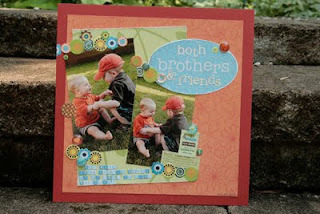 The challenge today comes from a blog site called Practical Scrappers. The site aims to issue challenges to help us all use up some of the valuable stuff we've already got. This week's challenge is to use up some of those stickers! Here's my concoction: I also managed to use some new brads, a new diecut( which I honestly never thought I'd find a use for!) and those pebbles I've been trying to use since I bought them months ago! I struggled with this one, especially after my pal Noemi gave me some magic mesh to use, and Claude says " If you can't use your screw head brads on this one...where will you ever?!" 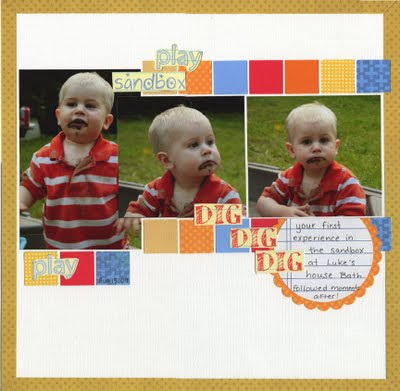 I ended up trying desperately to keep this one looking current, and not something out of a 2006 Creating Keepsakes magazine. 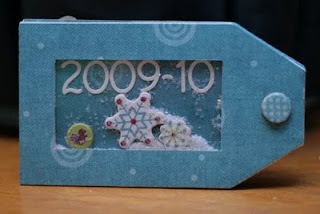 a little digging through my paper, through the tool box, and even into the embossing powders made this one fun to do...OK so maybe it is in keeping with 2006 style! Warning: The items you are about to see are seriously cute! Last year my buddy Claude and I stocked up on a whole bunch of these Creative Imaginations luggage tags from the liquidation section of our LSS. 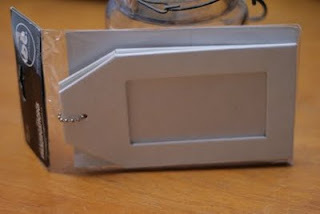 Then Friday night, I bought some awesome MME products. I was kinda beating myself up about it, as I don't really need more Halloween or Christmas paper ( ok ANY paper for that matter!). I decided this morning I had to make myself feel better and put some of it to use. 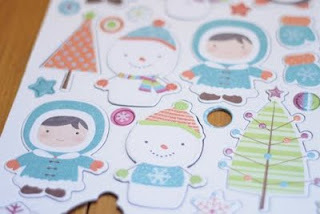 just look at these chipboard stickers!! 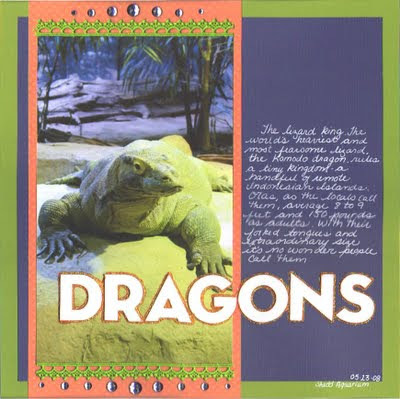 I couldn't use the opening for a photo, because thankfully we don't have any winter photos yet for this year. ( as I write this it's 30 degrees celcius in the shade!) 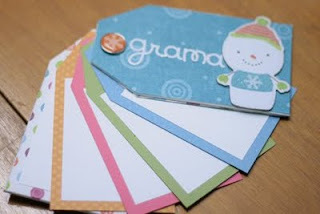 I made a little shaker box out of the back cover and put some more of the cute chipboard shapes and some "snow" inside. Now I've gotta go come up with something to use up some of the Halloween stuff :). It wasn't instant love I must admit, but after a few long hours fiddling with the settings and trying on different templates, I have found blogging peace here at Blogger! One day, I hope to master HTML, and really understand how all these things come into being, but for now, I'm happy to leave the template creation to the experts, and concentrate on my own creative endeavours. Speaking of creative endeavours...Hubby is out for the evening and the kids are sound asleep ( keep your fingers crossed for me!) I will now attempt to make my way through some of the clutter in my scraproom ( damn laundry!) and try and get to gluing! Welcome! I've moved from Wordpress to Blogger! Hopefully everything else will only get better from here on in!